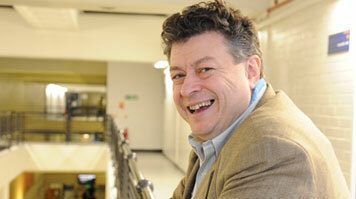 Rory Sutherland, vice-chair of advertising giant Ogilvy & Mather UK, gave a lecture at LSBU yesterday on how to restore public trust in the banking and financial sector. The evening lecture was presented by London South Bank University's Centre for International Business Studies in collaboration with the Ehrenberg Centre for Research in Marketing. Following a stint as a classics teacher, Rory Sutherland joined Ogilvy & Mather's planning department in 1988 and became a junior copywriter, working on the American Express, Royal Mail and Microsoft accounts. An early fan of the Internet, he was among the first in the traditional advertising world to see the potential in these relatively unknown technologies. Today he is the executive creative director and vice-chairman of OgilvyOne London, vice-chairman of Ogilvy & Mather UK, a frequent guest speaker and magazine columnist. In his lecture Mr Sutherland argued that the 'binoculars' of consumer behaviour—the twin lenses of market research and conventional economics—are broken models because they don't consider the role of human trust in buyer–seller relationships for the sake of of mathematical neatness. Mr Sutherland used real-world examples to demonstrate how people make seemingly irrational decisions, defying economic logic and unsupported by market research, that actually turn out to be highly intelligent. He argues the case for a 'third eye' in his binoculars metaphor to begin to understand why consumers do things which conventional marketing and economics cannot explain. Relating this to the banking and finance industries, Mr Sutherland spoke of 'the line of provenance' of reputable brands, arguing that it is impossible for us to trust people—and brands—we cannot 'hurt'. He argued that while a bank manager was once part of the fabric of a community whose reputation was at the mercy of his customers, we're no longer able to exercise this "credible threat of defection". Rory Sutherland's lecture was part of the CIBS lecture series, to be followed by: 'Evaluating the board of directors of your company—and why it matters!' by Simon Osborne, chief executive of the Institute of Chartered Secretaries and Administrators; and 'Government intervention into the UK food industry: when is it desirable or feasible?' by Nicholas Daniel, economic adviser to the Food Standards Agency.